NB are those pics of your bike shortly after you took delivery? I cant get my bike that clean for love nor money! I never leave my bike dirty, or use water to clean it , try my best to keep it mint . Eih?you don't use water? Don't tease what do you do? never ever put a pressure washer / hose on any of my bikes , tried not to get caught out in rain, have been caught out a couple of times and the bike came back filthy, a damp sponge is suffice to remove any bad dirt, followed by any waterless wax/ canuba polish cleaner (use to use greased lightning , works well or Williams do one as well cheap on qvc ) , after a ride out bike is always cleaned generally I use a bottle og cheap glass cleaner from a spray bottle , sometimes polish with simply mr sheen, or auto glym quick detailer , works well for me ….I can understand if you go off road (trials / scramble ) you wold need a pressure washer , but not for my bikes , water gets EVERYWERE , like to keep my bikes as dry as poss . just my opinion. it must work, as I get a lot of comments on how clean the bike looks . Right so my footoegs arrived within 2 weeks actually. Today is first day I got to fit them. Just trying. To figure out how as instructions are all in Chinese also trying. 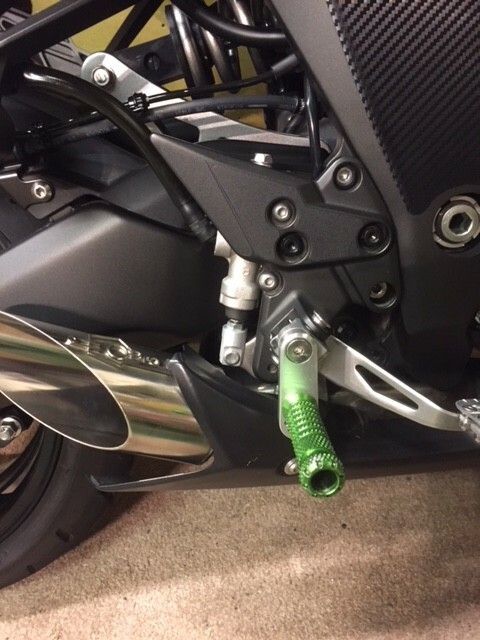 To figure out how to drop the rear brake lever. Assuming the brake light switch will adjust as the lever adjusts? should only take you two mins to remove your old pegs ,about the same to fit the new ones , very simple to do , fix your foot rest to the plate first then mount it on the bike , you may have to try it a couple of times till you get the best position that is good for you , once you have it in the correct place I used a drop of Loctite before I finally secured it into place, once you adjust your brake pedal (search on the forum there is instructions ) the switch for the brake light is adjustable separate to the brake pedal , the switch is inside a round plastic body that just screws up and down, honest it is easy once you have a look at it , I found it a bit awkward to get my hand in so I undone the two bolts holding the lever bracket in place gives you a bit more room . Yup correct 5 min job but I forgot to adjust the brake light switch oops back to the garage.